Special Presentation Tomorrow - Send in Your Questions! ~ The Toronto Hare Krishna Temple! Special Presentation Tomorrow - Send in Your Questions! 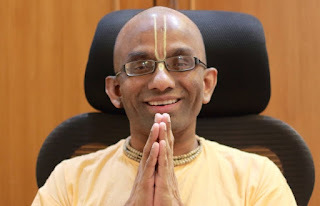 The Toronto Hare Krishna Temple welcomes Chaitanya Charan Dasa this weekend. Chaitanya Charan is a monk and spiritual author. He has done his Electronics & Telecommunications Engineering from the Government College of Engineering, Pune. He subsequently served as a software engineer in a prominent multinational software corporation. Sunday's Presentation (6:30pm - 7:30pm) will focus on the theme of "Destiny: Do we make it or does it make us?". To facilitate an interactive session, we are collecting questions you may have about destiny. Please fill out the box below and we will try to get to all of these questions!